Okay! 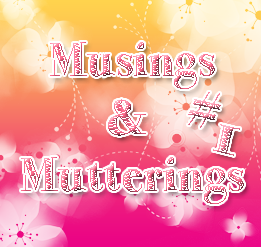 Musume Time: Musings & Mutterings: Oh Look, Episode 1! Due to over-excitement at the idea of creating my very own podcast as well as the positive reaction it garnered, I decided to record the very first episode! It is about 15 minutes long, give or take 30 or so seconds, and I talk a little about going home for the holidays after the end of my first term in University, the positive feedback on creating the podcast from readers and also a bit about Idols and also why I stopped my Digest. Basically, I just talk, as I said I would. I am making progress! You Can Listen to Episode one HERE!!! I'm still at a stage where I can't make my words flow properly, however this is just the first step for me, so eventually I will get better at this. I had fun recording it, even if the first few minutes were in total silence before I edited it to make it look like I was prepared. Honestly, this is scarier than I thought it would be, but I am enjoying it so far. Hopefully you guys will enjoy my rambles as well! I aim to update every time I upload a podcast, and if not, I should have updated the newest tab added to my blog beneath the banner! If not, then simply check the website link that should be there; I want to try and do this regularly, at least once every week or bi-weekly if I'm busy, because talking is a lot easier than writing or creating a video and it will allow me to keep you updated on different things I believe. That, and it will be fun to do a series again! That is the update for now. I hope you all have a lovely day/afternoon/evening, and enjoy!